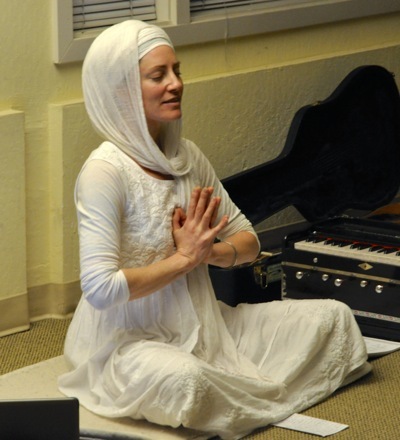 Amidst the jazzercise and zumba classes, a new calm has descended on the Little House Activity Center in Menlo Park — and it comes in the form of Kundalini yoga, called by practitioners “the yoga of awareness.” Typical class structure includes a 5-10 minute warm-up, 30-45 minute kriya (manifestation through movements), 5-15 minute layout, and 11-31 minutes of meditation. At Little House, the winter Kundalini Yoga class featured the first graduating class of Kundalini Yoga teachers who studied in Santa Cruz. A group of nine students, along with their teacher, Dukh Niwaran Kaur, teamed up with instructor Shanti Das to teach lessons that embodied healing. The session finale on Feb. 25 featured special guest teacher Charanpal Kaur (pictured right) and sound therapist Danny Goldberg. Seeing life as an opportunity for learning and growth, Charanpal — in addition to being a certified Kundalini Yoga instructor — is a student of Spiritual Psychology, Odissi Classical Indian Dance, and traditional Gurbani Kirtan, the music that goes hand-in-hand with Kundalini Yoga. Her topic at Little House focused on healing through forgiveness. “When we hold judgments of ourselves and others, it is as if we live our lives in chains, ” she said. The Little House spring series, “Kundalini Yoga for Digestive Health & Cleansing,” will begin on Tuesday, March 4 and run through May 20. The focus will be on helping your digestive system enhance the optimal function of your body, mind and spirit. All levels of experience welcome. The class is held from 7:00 to 8:45 pm and suggested fee is $8.